Banquets, Luncheons, Receptions, and Corporate events. that will make the musical portion of your event a memorable occasion . by almost every known composer. A wide variety of flute music in midi format can be found here. From this page there are also links to many other flute pages. 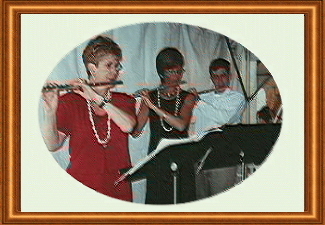 Dorothy Connors is an experienced flutist, having played with The New Haven Symphony, The Sacred Heart University Community Chamber Orchestra, Stratford and Milford Symphony Orchestras. She plays in trio's, ensembles, orchestras and as a soloist. She is available for private flute lessons for both children and adults. Email Dorothy and she will promptly be in touch.